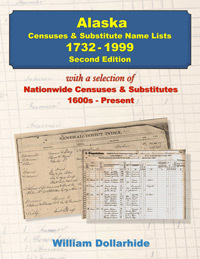 This new Second Edition includes 54 Alaska State URLs - all links to databases. Three Hundred Thirty-Five National URLs are also included. There are an additional 12 pages in the Second Edition (as compared to the First Edition). All books currently come with a FREE download of the full-color pdf eBook. Upon placing your order, you will be able to download the FREE PDF eBook directly from the FRPC screen. You will also be sent an email from where you can click on the link and download the item. You can only download the PDF eBook once, so if you make your order from a computer other than your own, you might want to wait until you get to your computer and do the actual download from the email. Your book itself will be mailed by USPS media mail, and can be expected to arrive within 7 to 10 days within the United States. This book is also available in an electronic pdf format.